Don’t Give Up. Do Your Dance and Praise Him in Advance. According to Pastor Marvin Sapp, Life Gets Sweeter as the Day Goes By. On January 28, 1967, like at the Azusa Street Revival, a supernatural event took place. A Godsent American gospel music Hero was born. Lodena and Henry welcomed their son, Marvin Louis Sapp. If he could talk then, I can imagine him saying, “Here I Am.” Without God, I Never Would Have Made It! Marvin Sapp, the Miracle, was called to spread the good news of Jesus Christ. As a result, he became a renowned gospel music artist. The loving father is a worshipper, a singer and songwriter. He is also a gifted pastor, evangelist and author. Pastor Sapp is a frequent guest at Christian crusades, Christian concerts and other events. He has been featured on several Christian broadcasting networks and Christian radio stations. Pastor Marvin Sapp grew up in Grand Rapids, Michigan. He has four brothers and is the shortest. Don’t Get It Twisted. Jesus Ministry included ministering to a short man. Zacchaeus climbed sycamore trees to see Jesus. (Luke 19:1-10). Little Marvin would climb the gospel charts. He had destiny on his life. His musical talent was evident as early as age four. He would stand tall among gospel music greats. His father, a musician, sang gospel music in quartets. His mother did not have the gift of singing. However, she had the gift of wisdom. She was a very wise mother. She taught Marvin hymns and other gospel songs. Most importantly, she challenged him to “choose ye this day whom you will serve.”(Joshua 24:15). Young Marvin Sapp was told by his mother to choose between Honoring the King or singing for the devil. Above All, Marvin chose to sing about the love of Jesus Christ. At age 10 his parents divorced. However, as a child, Sapp was More Than A Conqueror. He remained Faithful to his musical calling and kept singing. His musical path was somewhat similar to his father’s’. As a teenager, he sang in gospel music groups, too. God was setting him up to Possess the Land. Later, Marvin joined Fred Hammond & Commissioned. After doing albums with Commissioned, Marvin Sapp produced 7 albums. He began his new gospel music career as a soloist. His singing included three gospel music genres. They are Gospel and contemporary Christian gospel music. He has also recorded inspirational and worship songs. In 1996, things Changed, Pastor Marvin Sapp began to experience unexpected losses. Seemingly, things were not working out for his good. He experienced the death of his natural father, Henry Lewis Sapp, Jr. Within days, his spiritual father and gospel music mentor died. In spite of what he had gone through, he went to church. However, it was not his intent to preach. He sang, instead. A song came out of his storms. He sang Never Would Have Made It for the first time. It was from the portals of heaven. Initially, Marvin Sapp did not include Never Would Have Made It in his album plans. The single spread like wildfire. The gospel song and album Thirsty were top hats on the charts. The powerful productions crossed over into the R&B, Hip Hop genres. They were listed on Gospel Billboard Charts. At 500,000 copies, Thirsty was certified gold. Over 700,000 have been sold. People are still buying this best seller gospel album, even as I write. In gospel music today, Marvin Sapp has recorded at least 120 songs. I’m quite sure it Feels Real Good to have such a powerful anointing. Still Standing on the Rock, this time, Marvin Sapp made gospel music history on Billboard. With God as His Strong Tower, his album sales excelled again. Hallelujah! They were higher than anyone in Billboard’s 54 year history of gospel albums. God was taking him Deeper. In 2009, Here I Am help crown the chart at No. 2 in its first week. Almost 80,000 copies were sold. He saw the Best in Me was the leading single on the album. It was No. 20 on the Urban AC chart for Billboard. It also crossed over to Hot R&B and Hip Hop charts as No.14. It took the lead in in gospel songs. It was No. 1 and was written with the help of Aaron Lindsey, a producer. 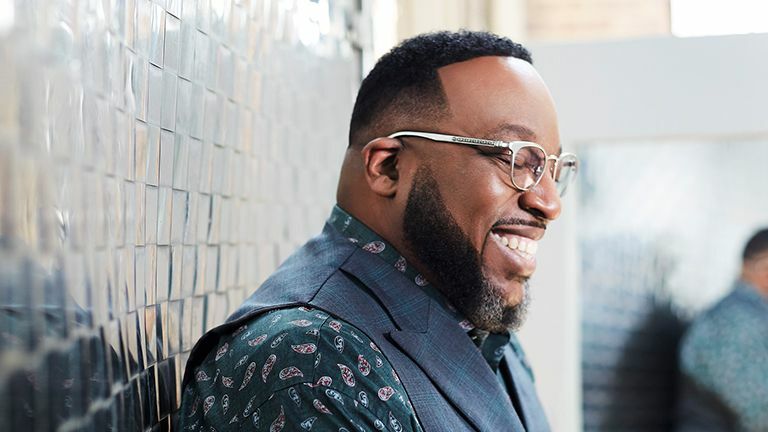 Because of Grace and Mercy, Marvin Sapp won several exceptional awards. He won 10 Grammy Awards and 22 Stellar Awards. He was awarded 8 BMI Songwriter Awards, 5 Dove Nominations and 2 Dove Awards. Sapp has won 2 Best Gospel Artist, BET Awards, 2 Soul Train Music Awards and more. His albums and videos feature at least 120 contemporary Christian gospel songs. He has two honorary degrees in theology and has a Doctor of Divinity and a Doctor of Ministry from Aenon Bible College and Friends International Christian University. Marvin Sapp was called to live the life of a Christian disciple. Preparation for the “singing preacher” calling also began at an early age. Before his career with Commissioned, he enrolled in Aenon Bible College. His singing gift began to merge with the call to preach. He married his third grade sweetheart, Malinda. The Lighthouse Full Life Center Church thrived. Three children were born. They are children Marvin II, Mikaila, and Madisson. The late Mrs.Sapp filled several ministerial and personal roles. As wife and mother, she was a counselor and college professor. She was the executive manager and pastoral administrator for husband. Marvin Sapp believes in transparency. He believes music is ministry. The main focus of his music ministry is to encourage others. He has a heart for the younger generation. Marvin also believes in the faithfulness or dependability of God in all circumstances. He is Faithful. He Won’t Fail. As a member of Alpha Kappa Psi, Marvin encourages the pursuit of greatness. Most of all, Marvin Sapp values spending time with family and friends. One of his most favorite places to visit is Hightower Memorial Temple in Douglas, Georgia. A supporter of stroke awareness, he has his own “clean” gospel reality show. Like Marvin Sapp, He Has His Hands On You, too! Just say, “Lord Be It Unto Me.” Give Praise to Him for the Fresh Wind that He wants to send upon your life. When challenges come, Keep Holding On. If You Just Believe, God will give you the power you need. Live the Life God has predestined for you. So, Lift Those Hands and tell the devil, “Don’t Count Me Out!” Say Jesus. I Belong to You. For the Rest of My Life, Here’s Where I Belong! As in Psalms 27: 4.One Thing I asked from the LORD; this do I seek; that I may dwell in the house of the Lord all the days of my life……” Nothing Else Matters. Glory to the Lamb! O Taste and See that the Lord is Good! I hope you were blessed. Share your comments with us. Allow us to feast with you. Visit us at KNCB.ORG for more articles, listen to Christian radio. Hear other great gospel songs such as Bow down and Worship Him. Get a rhema word from Azusa Street Revival sermon videos. Watch Christian Movies, such as the Ruth Movie. Also, visit our Faith Shop to see the Walk By Faith greeting cards and photographic prints. Like us on Facebook at Kingdoms Network Christian Broadcasting. Thank You So Much! God Bless You and Yours!